May happiness surround you always. 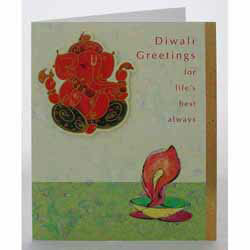 Warm Diwali and New Year Wishes. This card is hand finished for a unique look. "Dear Spices of India, Hi there, I received my order today and again an excellent service. Many thanks for the great packing, nothing broken, what a great job. I will take great delight in ordering some more stuff soon. Please give my compliments to all concerned. Kindest Regards,"